BAGUIO CITY — Still reeling from the destructive impact of Habagat (monsoon) and Typhoon Ompong, the knee-jerk decision to close small scale mines in the region and insufficient government assistance aggravated the dire situation of disaster victims in the Cordillera. 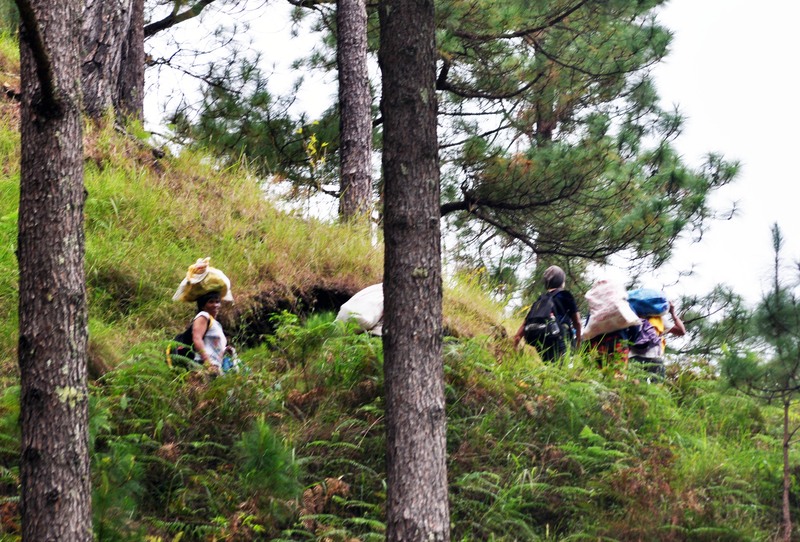 Residents from one of the mining-farming communities in Benguet said that unless the government immediately provides alternative sources of livelihood and sufficient support, they will be buried deep in debts in no time. This was a common sentiment among the communities the National Council of Churches in the Philippines visited during the conduct of Operation Paglingap in the province. “Most of us are now depending on loans to sustain our daily needs,” shared Lorna Busakay in the sidelines during the relief mission in Barangay Cobabeng, Bokod on October 16. Her husband works in the gardens and in the small scale mining livelihood of their community. She said they have been losing income since Habagat that destroyed most of their crops and prevented men from the village to work in the mines. “Our husbands were just about to start tending their gardens and return to the mines when Typhoon Ompong (Mangkhut) struck,” she recounted in their local language. With Cimatu’s (DENR Sec. Roy Cimatu) order to close all mines, Lorna lamented that they are not only forced to apply for loans but also move out of their community and leave their kids to find jobs. “Ompong was a disaster for one day, but the order to ban small-scale mining is a lifetime disaster. They stopped the operation but did not elaborate what kind of alternative livelihood they can offer,” she said. Military and police units were deployed in Benguet, especially in Itogon to ensure the stoppage order. The troops have been rounding up small-miners, including those panning gold in the rivers and creeks since then. According to Manong Agosto Matso, board member of the Association of Bolo Indigenous People, there are 87 families in Cobabeng whose primary resource is the SSM operation of the community. “The blanket ban is unfair and unsound decision. If they should close the mines, it must be selective and temporary. This has been part of our life for centuries,” pointed Manong Agosto. The community elder pointed out that instead of pressuring them, forcing the people to hungry and be buried in debts, the government should institute mechanisms that can assist SSM workers to assess risk, improve their production and capacity to install mitigating measures. Manang Juana Paterno, whose sons are also working as small-scale miners said after the order, they are now constantly working with fear and uncertainty. “We have limited lands here for vegetable production and we are also prohibited to expand our gardens by the government. Now, the ban also keep us from panning gold to augment our income and have some extra cash,” she narrated. The police has been rounding up small-miners, including those panning gold in the rivers and creeks since Environment Chief Roy Cimatu issued the ban on small-scale mining (SSM). Like Lorna, Manang Juana now largely depends on credits provided by lending institutions, relatives and traders for their daily and production needs. She said without her sons’ work, they will definitely be buried in debt. While they have already planted new crops and were able to salvage some harvest, tomato and watercrest growers in Barangay Ekip in Bokod are also worried of their growing debts. They said, tomatoes from their place command a high demand in Nueva Vizcaya that is why they lost quite a significant profit after failing to bring their harvest due to road cuts & closure. The one-way road going to Ekip proper was only opened more than a week after Ompong. “Our crops are mainly financed through credit from cooperatives and farm supply stores,” shared Florencia Gonzalo, a village council member. She said many of the growers failed to earn enough to repay their debts but are forced to again apply for loan to be able to regrow their crops. Those who are growing water cress, like Manang Mary Pando, are also depending on loans from their cooperative, friends and relatives. The creeks and rivers swelled, taking with it rocks, soil and the water cress beds cultivated mostly by those who have no lands to till. They are able to sell a bundle of the plant for P25, with their daily earning from the sale barely enough to cover their needs. “We are looking for good spots to plant our water cress. In the meantime, we are trying to meet our needs through pordia (daily wage labor) and credit,” she said. Meanwhile, temperate vegetable growers in Baculungan Sur, Bugias are also acquiring more loans, with the hope that they can repay their previous debts. Based on their stories, the farmers experienced a triple whammy, leading to a big drop in profit and bankruptcy to some. Before Ompong, they have already suffered losses from Habagat due to water soaked gardens that greatly reduced their potato harvest. Just after a few weeks, they were again hit by Ompong, destroying crops that survived the previous heavy downpour. “We were able to harvest some but failed to bring it in immediately to the market since our roads were closed by landslides. We were isolated for almost two weeks,” Jerome Tomas recalled. During the said period, they did not only incur losses from the destruction of crops but also missed to sell their produce at a higher price. He said, his harvest would have reached about 3000 kilos with a farm gate price of P40-P50/kilo before the disaster, saying he could have easily paid his debt. His production needs were acquired through loans with a 3% monthly interest. But since there is no harvest, he will be asking for another P20,000 on top of his existing P40,000 credit. Since Habagat and Ompong, the community has received little assistance. They said they have already brought their request for irrigation hose and seeds to the local government, but have yet to receive them.